Gluten-free diets have been popular for people who are intolerant to, or cannot digest, gluten. Gluten is a type of protein that you would find in many of the grains and breads you eat at any given time. It’s quite the rage to go on a gluten-free diet these days, with even celebrities like Gwyneth Paltrow and Elizabeth Hasselbeck boasting about the supposed health benefits. But what exactly is a gluten-free diet and how do you know if you should try one? Before it became stylish to try a gluten-free diet, the only people adhering to it would be those with celiac disease. People with celiac disease cannot digest gluten. That means they can’t eat any processed foods that contain the protein derived from wheat, rye, spelt, oats, triticale, kamut, or barley. 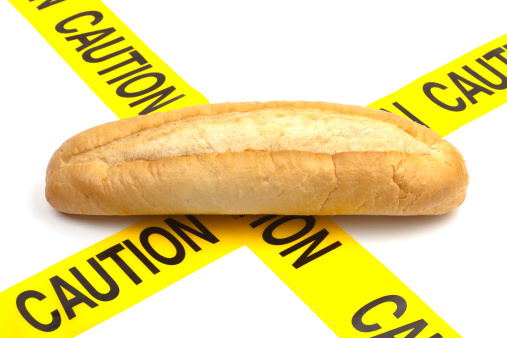 It’s estimated that one out of every 133 Americans has celiac disease. It’s an autoimmune disease, and, right now, researchers don’t know why some people are affected while others are not. Unfortunately, it’s one of the most common chronic illnesses in the world. The symptoms include the following: diarrhea, anemia, abnormal bloating, constipation, certain vitamin deficiencies (often, people with celiac have difficulty digesting vitamins A, D, E, and K, and calcium), unexplained headaches, and body aches. Well, basically any unprocessed food is fair game. Things like fruits and vegetables, beans, legumes, and even rice. You’re also able to eat dairy, meat, oils, and poultry products. The problem begins when food producers mix items that are “gluten-free” with other ingredients or if they come into contact with a gluten product. If you’re eating unprocessed foods, you need to read the label carefully, and double-check the “may contain” section, and any notes about possible allergens. Many health-food stores and even your local grocery store often carry gluten-free products. Well, it sounds like sticking to a gluten-free diet can be pretty hard to do. So why would some people do it if they don’t have to? Because of stories like Rochelle Hoffman’s, who said she had undiagnosed discomforts her whole life, with doctors never being able to get to the bottom of them. Now in her 60s, she decided to try a gluten-free diet, and she said she immediately noticed that many of her symptoms subsided. Many people believe that a gluten-free diet will help them lose weight. Well, it could, considering you may be eating less carbohydrates and more unprocessed foods like fruits and veggies. But these days you can get gluten-free bread and pastas, so what was true in the past is not true anymore. If you’re going to cut all gluten from your diet, you have to be aware of the potential risks, too. Many gluten-free foods contain less vitamins and minerals than other gluten products. If there’s no gluten in them, that means they mostly contain starches, sugars, and fats—not things you want to gorge on. And, gluten-free diets may be low in fiber—so even if you’re eating less, you won’t feel fuller and you’ll snack more. We believe that eating healthy shouldn’t require prescriptions or constant dieting. So when might a gluten-free diet work well? If you’re someone who has suffered with unexplained dietary symptoms, it may be wise to try eliminating gluten and then see what happens. It could be what works for you. Palmer, S., “Is the gluten-free diet the next ‘it’ diet for health?” Environmental Nutrition February 2010; 2. Warren, R., “Should you try a gluten-free diet? It may be the trend du jour. But it can also hurt your health—and waistline,” Good Housekeeping April 1, 2011; 48. Graham, D., “Should you try the gluten-free diet?” The Toronto Star September 29, 2012; http://www.thestar.com/life/2012/09/29/should_you_try_the_glutenfree_diet.html.